Parents KUSA Certified, OFA. Puppies ready for Christmas. There are Many International Champions on the Pedigree. Parents both Imported from Europe. 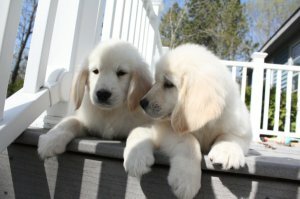 We have done much research over the years to find the Perfect Golden & have carefully Chosen our Goldens from some of the Top Kennels in Europe! We have found that the English Cream Golden Retrievers are very Mello in Nature and have Very calm Temperaments. The Pups have Substantial bone structure & a Gorgeous Thick coat. The puppies will be coming with KUSA registration, wormed 2x, 1st vaccinations & Health certificate, micro-chipped, crate .These babies will be large, confident babies that are so so beautiful, with good bone, beautiful coats and a joy to own. We breed for soundness correct type, coat, hunting ability, companion, agility, show and/or family. Please give me a call with any questions you may have. I look forward to working with you.